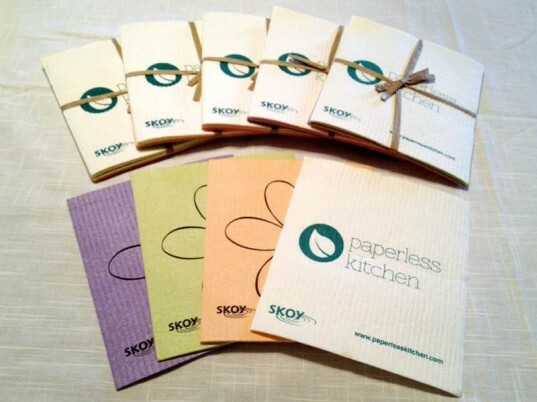 When Paperless Kitchen contacted me to write a review on their SKOY biodegradable cloths, I was happy to hear from them, because I love reusable items, but not overly excited because frankly, who gets excited over cleaning cloths? Plus, my household has been paper-free for years now, and during that time I've amassed a huge arsenal of cloths to clean with, so a few more didn't seem all that necessary. Still, I said, "Send me a pack and I'll give them a whirl." That was a GREAT decision. Turns out, SKOY cloths rock. They're not like any other cloth cleaning item I've ever used - they're much better! I was happily surprised by just how much I liked them. Keep reading to see what SKOY is and how these cloths can help you manage your paperless home with ease and save about $900 off your cleaning supplies bill over the next few years. SKOY Cloths work best on hard surfaces, such as counter tops, table tops, bookshelves and sinks, but I used them all over my house with ease. 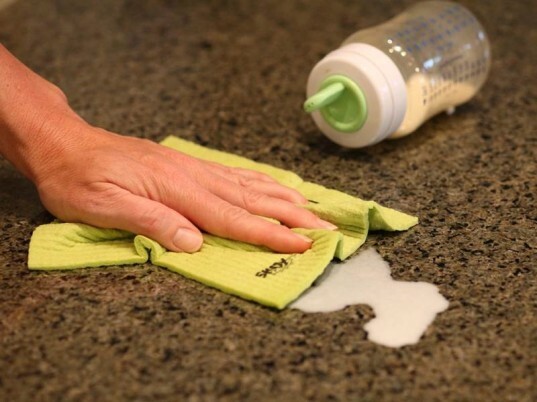 You just wet the SKOY then wring it out and use it to wipe up spills or scrub away messes. They also work well to pick up dust. You can use them with or without eco-friendly cleaners, though for most of my tests I used plain old H2O and the cloths worked amazingly well. After using, you can rinse and wring your SKOY out and use it again. Once your cloth is too dirty to use you can sanitize it in the microwave or toss it into the dishwasher or washing machine. They have a semi-scrubby surface, which most plain cloths do not have — and this resulted in faster, super easy cleaning with NO cleaners required. I wet SKOY down then used it to clean stir fry sauce off the stove top, soups spills in the microwave and much more. Even though I used zero cleaners, SKOY cleaned up each mess leaving no lint and no stickiness behind. The ability to clean so well sans cleaners of any kind is a huge perk that can save you money not just on paper towels, but on green cleaners too. SKOY left no lint behind on any of the surfaces I tried it out on, even white and glass surfaces. I’m not that picky about lint-free cleaning, but it was a perk. SKOY rinsed clean after each use by just running it under the sink faucet. It was crazy! I cleaned up a huge red veggie soup microwave mess using nothing by SKOY and water and not only did it get my entire microwave clean in about 2 minutes, but afterwards the mess rinsed right out of the cloth and it looked practically new. When I got my SKOY in the mail, they were a lot smaller than I thought they’d be. That worried me because how could they clean up bigger spills? Well, they can. According to the makers, SKOY can absorb 15 times it’s own weight, and while I have no way to actually measure that claim, I will note that my son spilled almost a whole glass of juice and SKOY sopped it all up easily. You can clean up dry messes too! In the mornings I always make coffee and because I’m tired, I usually spill some dry coffee on the counter. Cloth towels, even when wet, don’t work well on dry stuff, instead pushing little crumbs off the counter onto the floor, but SKOY wiped up dry stuff like coffee grounds and flour without moving the mess elsewhere. They washed up perfectly in my washing machine. I suggest you air dry your SKOY cloths though, because I did try drying one in the dryer and it looked a bit frazzled after, so hang them up to dry them in order to keep them in good shape. I thought the designs and colors were super cute — these cloths are so cute that they’ll even work as a nice green gift. All-in-all, SKOY cleaned up every single mess I threw at it and I never once used my cloths with a cleaner. I always used plain old water – so that was amazing. 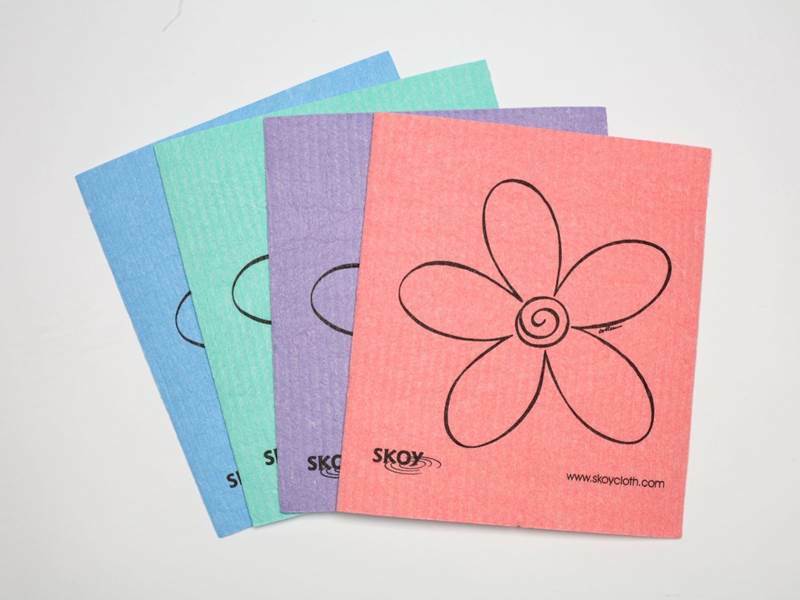 SKOY notes, “Skoy Cloth is both biodegradable and compostable. An independent composting test showed that a Skoy Cloth broke down completely within 5 weeks (16 weeks in a city landfill).” I’m very anti-biodegradable claims because tons of research shows that very few items are actually biodegradable in a landfill (or elsewhere). So, while I didn’t test this claim out, I’m not a huge believer that SKOY magically vanishes in the landfill. Still, it’s a MUCH better choice than paper towels which fail to break down in many cases, because you can use SKOY over and over. Learn more about what biodegradable means. You’re supposed to be able to toss SKOY into the dishwasher, but when I tried this, it didn’t really work all that well and the cloth still looked pretty dirty. I suggest you wash SKOY in the washing machine. You can’t easily use SKOY on fabric or mirrors. I tried it on both and it’s really a better hard surface cleaning item. It did work semi-well on mirrors, but left the mirror wet, so I had to use another, normal lint-free towel to dry the mirror. There are many SKOY options and accessories you can buy. 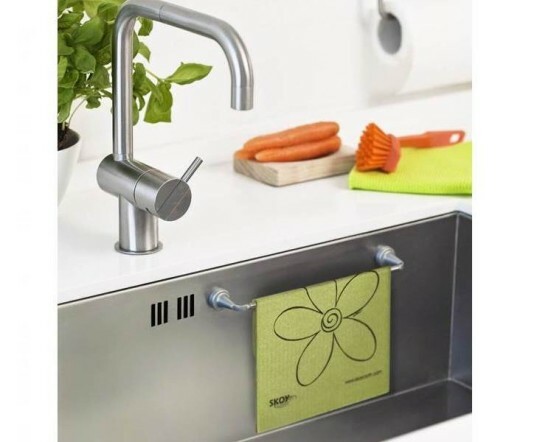 For example the SKOY Scrub which replaces old green scouring pads or scrub sponges and the SKOY Rail which is awesome because it gives you a handy way to store your wet SKOY. 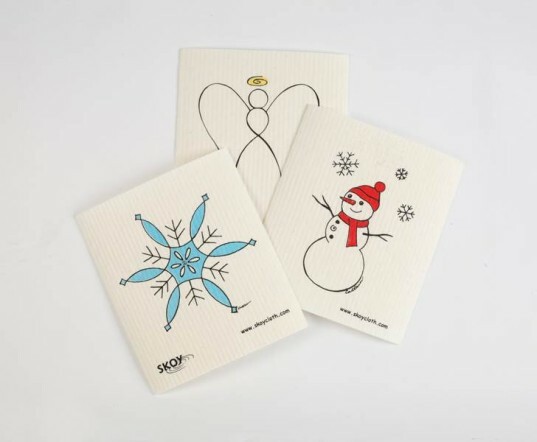 The basic SKOY cloths come in a HUGE array of designs and colors and you can also get small sets of 4 cloths or large sets of 32 SKOY cloths – enough for a long, long time. SKOY is a great deal for your budget. You can buy 15 rolls of recycled paper towels for about $56.00 OR you can buy one SKOY cloth for $3.00 which replaces all those 15 rolls of paper towels. That friends, is what is known as an outstanding deal. After using SKOY for a few weeks, it’s clear to me that each SKOY cloth will last a very long time, so I estimate that if a family of four buys the 32 SKOY cloth set for $55.00, the set will last you 2-3 years at least (replacing over 480 rolls of paper towels). Know how much 480 rolls of recycled paper towels would cost you? About $950.00 if you buy in bulk. Let’s see $55 or $950 – NOT a hard decision! You can order SKOY products at Paperless Kitchen or at the SKOY website, and trust me, you’ll be glad you did. SKOY Cloths works best on hard surfaces, such as counter tops, table tops, bookshelves and sinks, but I use them all over my house with ease. 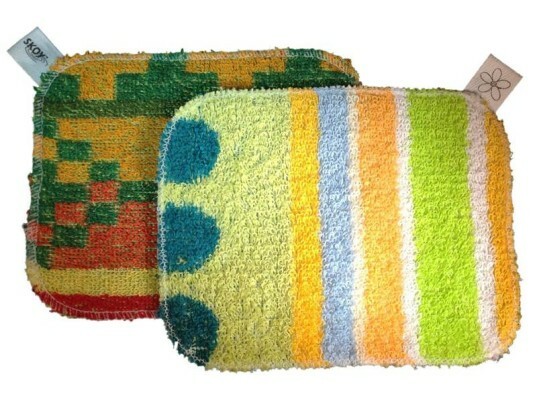 You just wet the SKOY then wring it out and use it to wipe up spills or scrub away messes. They also work well to pick up dust. You can use them with or without eco-friendly cleaners, though for most of my tests I used plain old H2O and the cloths worked amazingly well. After using, you can rinse and wring your SKOY out and use it again. Once your cloth is too dirty to use you can sanitize it in the microwave or toss it into the dishwasher or washing machine. I did not expect to be overly impressed with SKOY. Again, I've been paper-towel free for years and basic cleaning cloths work just fine in my opinion. However, SKOY had many perks that made me fall in love with them, such as: They have a semi-scrubby surface, which most plain cloths do not and this resulted in faster, super easy cleaning with NO cleaners required. I wet SKOY down then used it to clean stir fry sauce off the stove top, soups spills in the microwave and much more. Even though I used zero cleaners, SKOY cleaned up each mess leaving no lint and no stickiness behind. The ability to clean so well sans cleaners of any kind is a huge perk that can save you money not just on paper towels, but on green cleaners too. SKOY left no lint behind on any of the surfaces I tried it out on, even white and glass surfaces. I'm not that picky about lint-free cleaning, but it was a perk. SKOY rinsed clean after each use by just running it under the sink faucet. It was crazy! I cleaned up a huge red veggie soup microwave mess using nothing by SKOY and water and not only did it get my entire microwave clean in about 2 minutes, but afterwards the mess rinsed right out of the cloth and it looked practically new. When I got my SKOY in the mail, they were a lot smaller than I thought they'd be. That worried me because how could they clean up bigger spills? Well, they can. According to the makers, SKOY can absorb 15 times it's own weight, and while I have no way to actually measure that claim, I will note that my son spilled almost a whole glass of juice and SKOY sopped it all up easily. You can clean up dry messes too! In the mornings I always make coffee and because I'm tired, I usually spill some dry coffee on the counter. Cloth towels, even when wet, don't work well on dry stuff, instead pushing little crumbs off the counter onto the floor, but SKOY wiped up dry stuff like coffee grounds and flour without moving the mess elsewhere. They washed up perfectly in my washing machine. I suggest you air dry your SKOY cloths though, because I did try drying one in the dryer and it looked a bit frazzled after, so hang them up to dry them in order to keep them in good shape. I thought the designs and colors were hyper cute - these cloths are so cute that they'll even work as a nice green gift. All-in-all, SKOY cleaned up every single mess I threw at it and I never once used my cloths with a cleaner. I always used plain old water - so that was amazing. SKOY had very few cons that I could see, but some stuff to consider includes: SKOY notes, "Skoy Cloth is both biodegradable and compostable. An independent composting test showed that a Skoy Cloth broke down completely within 5 weeks (16 weeks in a city landfill)." I'm very anti-biodegradable claims because tons of research shows that very few items are actually biodegradable in a landfill (or elsewhere). So, while I didn't test this claim out, I'm not a huge believer that SKOY magically vanishes in the landfill. 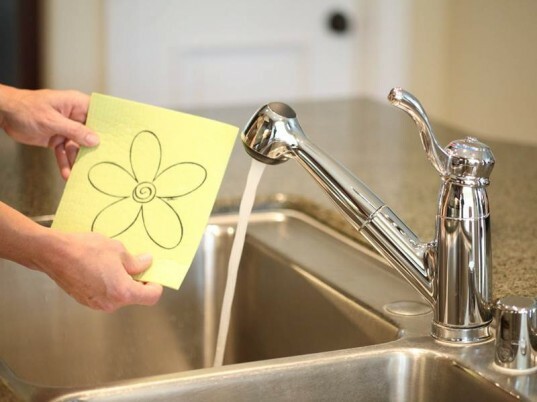 Still, it's a MUCH better choice than paper towels which also fail to break down in many cases, because you can use SKOY over and over. Learn more about what biodegradable means. You're supposed to be able to toss SKOY into the dishwasher, but when I tried this, it didn't really work all that well and the cloth still looked pretty dirty. I suggest you wash SKOY in the washing machine. You can't easily use SKOY on fabric or mirrors. I tried it on both and it's really a better hard surface cleaning item. It did work semi-well on mirrors, but left the mirror wet, so I had to use another, normal lint-free towel to dry the mirror. There are many SKOY options and accessories you can buy. For example the SKOY Scrub which replaces old green scouring pads or scrub sponges and the SKOY Rail which is awesome because it gives you a handy way to store your wet SKOY. The basic SKOY cloths come in a HUGE array of designs and colors and you can also get small sets of 4 cloths or large sets of 32 SKOY cloths - enough for a long, long time. SKOY is a great deal for your budget. You can buy 15 rolls of recycled paper towels for about $56.00 OR you can buy one SKOY cloth for $3.00 which replaces all those 15 rolls of paper towels. That friends, is what is known as an outstanding deal. After using SKOY for a few weeks, it's clear to me that each SKOY cloth will last a very long time, so I estimate that if a family of four buys the 32 SKOY cloth set for $55.00, the set will last you 2-3 years at least (replacing over 480 rolls of paper towels). Know how much 480 rolls of recycled paper towels would cost you? About $950.00 if you buy in bulk. Let's see $55 or $950 - NOT a hard decision! You can order SKOY products at Paperless Kitchen or at the SKOY website, and trust me, you'll be glad you did.